Hi everyone, welcome back to the first day of my First Look series. 4 days of previewing the brand new goodies leading up the Stampede and release on the 15th! :) As you know, I'm not very wordy, so I'll just move onto my projects. If you have any questions, please leave them in the comments section. First up is Splendid, the second set we commissioned from the fabulous Pauline Ibarra. her handlettering is simply off the hook. Her penmanship is just so graceful and elegant, these sentiments are a show stopper in itself! Here's my first card using this great sentiment from Splendid. The patterned paper is actually a background I stamped using some of the tiny images included in our new Around We Go set which you'll see more of later. And my second card, I went for a bright jewel-toned color block look. 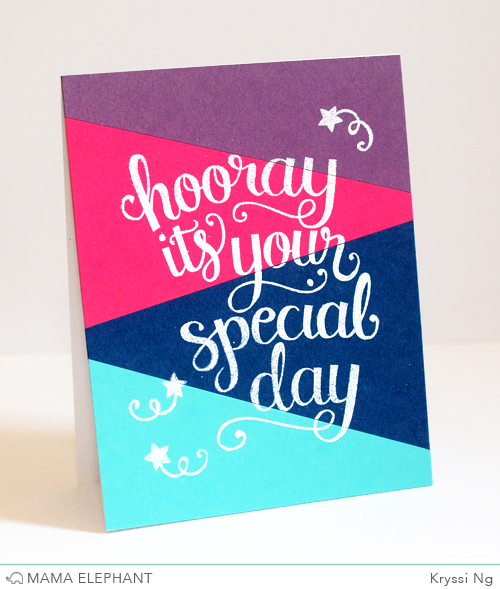 Pretty easy, just embossed the big greeting in white at the end after all the color blocking is complete. Love them both! Happy to see new sneak peeks! LOVE this SO much! I am definitely going to need this set! Fabulous samples, Kryssi! I love the background stamping you did on the first one... can't wait to see more of that set, as well! I must have this! Love the cards. Love these sentiments, and so excited to see more of them! Had noticed the Awesome sentiment used by Jennifer in online card classes and have been on the hunt for it, anxious to try your products! Beautiful lettering makes for an awesome font. Love it! I am counting down the days, May 15th can't get here fast enough so I can order this fabulous stamp set. Fabulous cards! 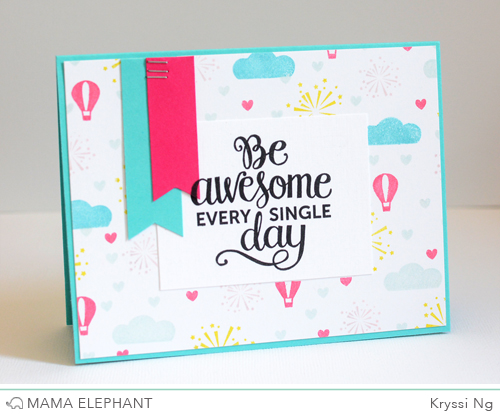 Love your background stamping and this awesome sentiment set! Love Pauline's work and your cards are fabulous! Adore adore adore, addicted to your products!! Can't wait to purchase this set and a few more of the new release!!!!! Can't wait for more of Pauline's sentiments!